(Nanowerk Spotlight) Electrochromic materials exhibit reversible optical change in the visible region when they are subjected to an electric charge. These switchable materials can be used for 'smart' windows in buildings, cars and airplanes as well as in information displays and eye wear. An electrochromic device is one of the most attractive candidates for paper-like displays, so called electronic paper, which will be the next generation display, owing to attributes such as thin and flexible materials, low-power consumption, and fast switching times. Electrochromic devices (ECDs) generally consist of a structure where certain material layers, among them an electrolyte, are sandwiched together. A major limitation until now has been the necessity to use the very expensive indium tin oxide (ITO) as transparent electrodes. ITO's brittleness makes it unsuitable for flexible device applications and its fabrication process – vacuum-coating, high-temperature annealing – is incompatible with plastic-based substrates. "ECD structure and manufacturing is to a wide extent challenged by the electrolyte component," Frederik C. Krebs, a professor and head of section of Energy Conversion and Storage at the Technical University of Denmark, tells Nanowerk. "As it remains common practice to employ a semisolid adhesive gel electrolyte, fabrication of devices is limited to separately coating of the two electrodes before finalizing the device in a lamination step; a technical challenge in a simple roll-to-roll (R2R) process and an impossibility in advanced R2R processes with 2D registration requirements." In new work, reported in the September 5, 2014 online edition of Advanced Materials ("From the Bottom Up – Flexible Solid State Electrochromic Devices"), Krebs and first author Dr. Jacob Jensen describe solid state electrochromic devices, manufactured by sequentially stacking layers in one direction using flexographic printing and slot-die coating methods. 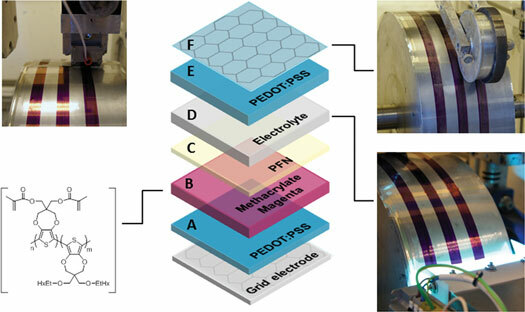 The novelty of this bottom-up printing process for electrochromic device fabrication is the use of printed grid structures in combination with printable electrolytes that can be crosslinked in such a way that many layers can be printed on top of each other. Whereas previous processes have employed the lamination of two separately prepared films, this new method provides the ability to constitute multilayer structures with functionality through printing layers consecutively on top of each other. "We show how – using a specially developed 'curing chamber' mounted on a mini roll coater – solid state electrochromic devices can be manufactured continuously in one direction, i.e., from the bottom and up, using slot-die coating and flexographic printing," says Krebs. "This technique eliminates the need for a lamination step and enables fully additive roll-to-roll processes." This considerably simplified process constitutes an important step towards R2R manufacturing of ECDs without having to employ brittle materials such as ITO. This new paper extends the team's previous reports on ECD manufacture such as "Fast Switching ITO Free Electrochromic Devices" in Advanced Functional Materials and "Manufacture and Demonstration of Organic Photovoltaic-Powered Electrochromic Displays Using Roll Coating Methods and Printable Electrolytes" in the Journal of Polymer Science. The ability to cheaply mass-produce ECDs will find applications ranging from light management and shading to large area/low cost displays such as billboards. Basically, it is a simple way of printing thin, very low cost and low power consumption display devices. The compromises that need to be made with this process are slow switching speed and relatively poor contrast. Both can be improved, notes Krebs, but since these devices rely on a chemical reaction taking place when changing color there are limits to the switching speed that can be reached. Krebs points out that the current version of his team's ITO- and vacuum-free grid electrodes still require further optimization to achieve the same optical transmission as the brittle ITO.